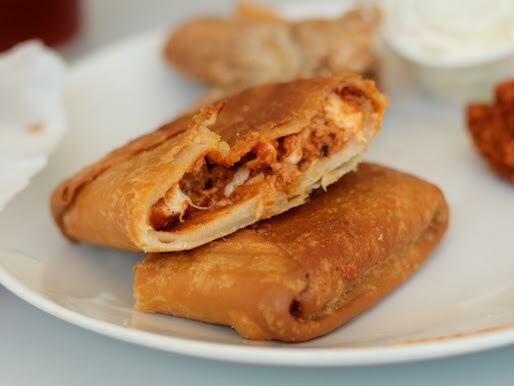 A pizza puff is, by rough definition, a deep fried dough pouch filled with cheese and pizza sauce as well as any additional pizza topping you might want. Originating in Chicago, though apparently available elsewhere if you’re really lucky and find a hot dog stand run by a Chicago transplant who is keen on being authentic, it occupies the part of the menu reserved for unhealthy side orders that you order with your hot dog in lieu of fries. In most Chicago stands, you can get a hot dog with mozzarella sticks, fried mushrooms, or a pizza puff as far as your fried non-French-fry options. 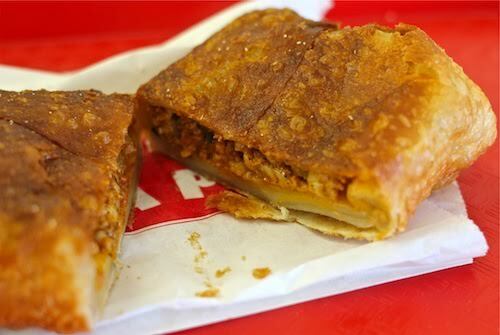 And while you can really do no wrong, if you’re feeling just a bit hungrier than normal, you’d be doing yourself a disservice in ignoring the flaky, melty, meaty option that is the pizza puff. By most accounts, pizza puffs were invented by Iltaco Foods, who to this day remain the sole purveyor of the pizza puffs you’ll encounter in a retail or restaurant setting. Originally established in 1927 (though officially founded in 1937) as the (Il)linois (Ta)male (Co)mpany (so shortened to Iltaco) they sold tamales, tacos, chili, and Italian beef to push cart vendors throughout the city before introducing the pizza puff, which currently represents their most popular line of products. You can actual buy them retail, but if you don’t have a deep fryer to cook it you’re pretty much wasting everyone’s time. One of the easiest parts of the pizza puff to overlook is the “dough” which, in this case, tends to be a folded up tortilla. The soft flour tortilla used in a pizza puff leaves you with a crispy outside and a sort of soft melted dough feel inside, while warming the inner contents to a perfect temperature. Iltaco provides many flavors of pizza puffs, including some non-pizza-filled puffs such as ham & cheese with jalapenos or a breakfast puff with eggs, sausage, and cheddar, or even a gyro puff, which takes gyro meat, green peppers, onions, jalapenos, mozzarella, and yogurt sauce…all three of which have been tasted by roughly thirteen people who don’t work for Iltaco, because, come on, that’s just a fancy hot pocket at this point, we’re here for some deep fried pizza goodness. Pull yourselves together, man. If you’ve had a pizza puff, well, you’re a lucky person who probably has a slightly shorter lifespan ahead of you (worth it! ), but also, if you’ve had a pizza puff, you’ve almost certainly had the “original” pizza puff (a delicious blend of mozzarella cheese, sausage, and “home-style” pizza sauce, whatever that means). There’s a beef and a pepperoni version of that as well, but the best use of a pizza puff is ground up sausage—these aren’t big pieces, they’re basically ground to bits in there where they mingle with the melted cheese and the slightly spiced pizza sauce that melts in your mouth with the crispy and soft portions of tortilla. The pizza puff is greasy as hell, it has roughly “you don’t want to know so you didn’t even ask” calories, and they’re usually cheap enough to make you question what kind of ingredients are going into it for everyone involved to be able to make a profit, but you know what? It’s delicious. 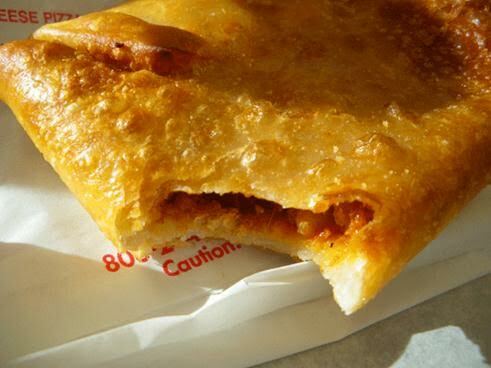 A day without pizza puff is, well, a day without a food nap and a doctors consult because eating this too often probably isn’t the best of ideas, but a lifetime without a pizza puff is just a tragedy. So hopefully we all can get this out of Chicago and to the rest of America, where it belongs. Calzones have had their day in the sun, let’s give America their far less healthy alternative. Because this is America, and this is fried pizza pockets, and this is why we’re the best country in the world. Pi-zza-puff! U-S-A! This entry was posted in America's Best Foods, America's Culinary Treats, Pizza Pizza and tagged America, pizza, Pizza Puff, pizza sauce. Bookmark the permalink.